The Brasserie at Regent Hotel Taipei is renowned to be the best place for buffet in Taipei. During our last visit there, we were invited by our long time family friends to savour the dinner buffet here. Apparently, the Regent Hotel has hosted many dignitaries, celebrities and NBA stars such as Kobe Bryant and Jeremy Lin during their visit here. The wait-list for the buffet dinner in The Brasserie can stretch up to few weeks or months depending on the time of the year. Luckily our friend persistence was rewarded and we got a lucky break when someone cancelled on their booking. 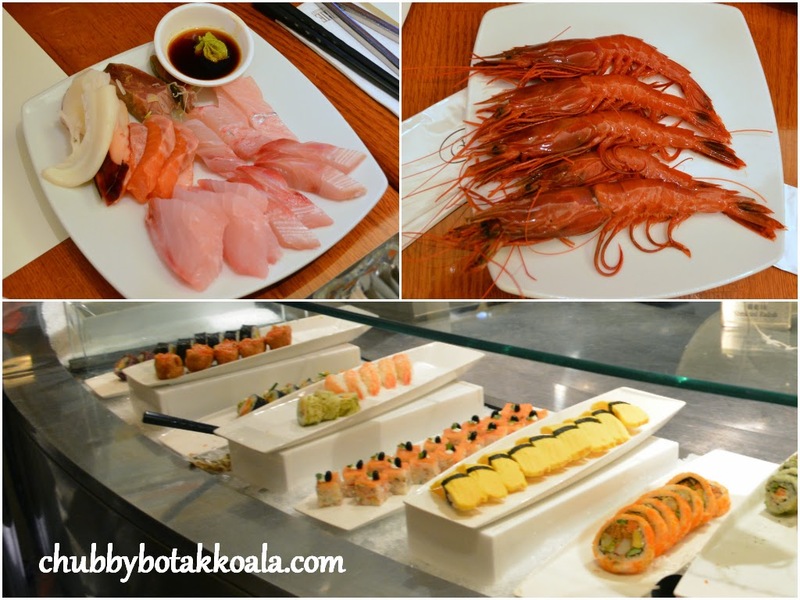 One thing about the buffet here, seafood are abundance and they only served the current seasons produce. Their proximity to Japan and the ocean, ensure all the seafood are fresh. Today, Spanner Crabs, Serrated Swimming Crabs and Three Spotted Swimmer Crabs are on offered. This is the first time I tried these variety of crabs. The crabs are fresh, however I just can't get used to the texture of the meat. I just find it a little more coarse compare to silky smooth texture of mud crabs. Next in line are the sashimi. 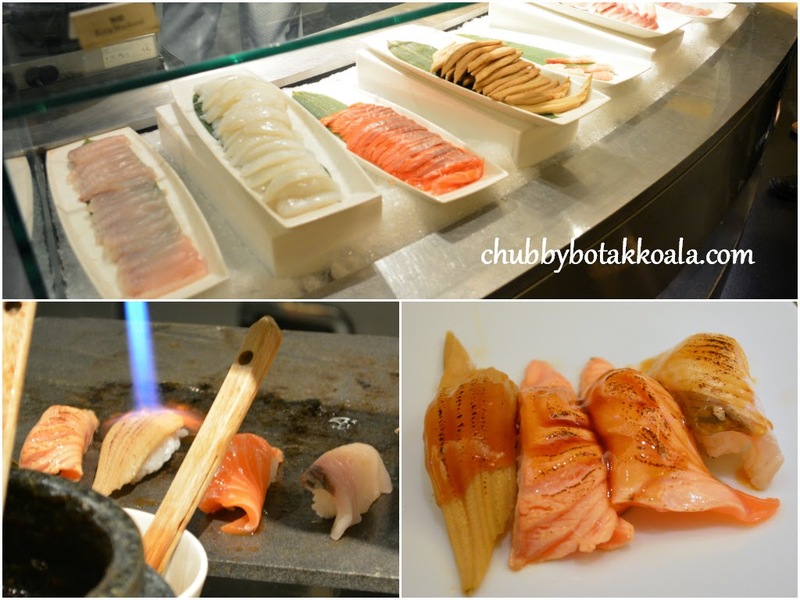 In which they offered, Salmon, Tuna, Yellow Tail, Sea Bream, scallops and abalone. The sashimi are fresh and the cutting is very generous. Some of the cuts are slightly chewy, probably the use the middle section of the fish. The best raw seafood for the night is Amaebi Prawns. These prawns are breed for Sashimi purpose. They are fresh, bouncy, juicy and huge in size. Yum Yum. This is Little Devil's favourite and she can't stop eating it. The grill sushi is also not to be miss. You can choose the following toppings: salmon, eel, prawns, scallops, calamari, and yellow tail. The chef will made it on the spot, torch it, bask with sweet unagi sauce. For torching, all the toppings must be fat and juicy. The torching made the flavour more concentrated and awesome. Moving on to the cooked food, the roast USDA prime rib is just excellent. 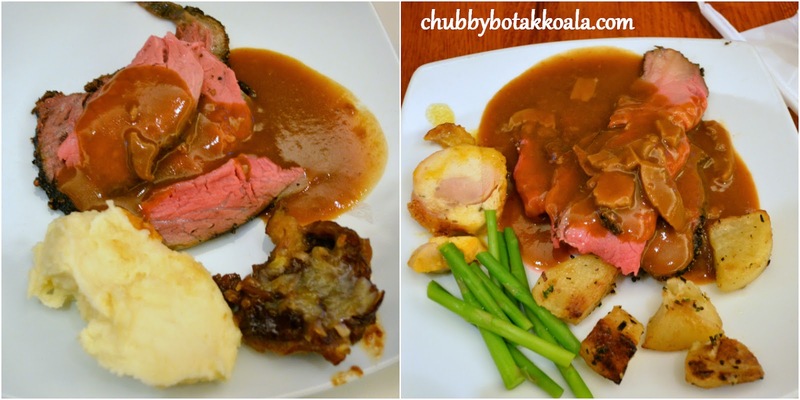 Cooked to medium rare, it is juicy and tender, well accompanied by the solid version of mash potatoes and Yorkshire pudding. Went back for the second servings of prime rib and filled the pudding with loads of gravy. We also tried their baked oysters, roasted pork knuckle and foie gras moose on bread. The baked oyster is nice and the cheese did not overpower the flavour of the oyster. However, we still prefer our oyster raw. The pork is closer to be braised than roasted, missing the crispy part. It is tender but goes down well with the dijon mustard which cut through the fats. The foie gras moose is smooth, flavourful and a good appetizer, which I consume as dessert. The pastry selection here is very extensive. The caramel pudding and lemon dome has a good balance between taste. The cakes are soft, moist and delicious. Desserts on shot glass are not to be miss. In summary, it is just superb. 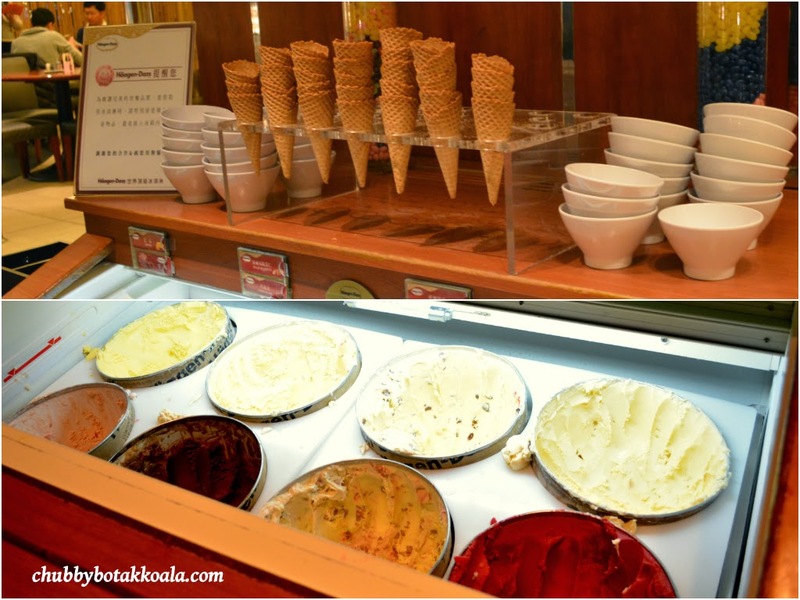 Did I mention the Häagen-Dazs ice cream for desserts as well? We did our best to cover and tasted the different variety on offer. However it was just so overwhelming. We did not manage to try the sushi roll, some of the cooked food, traditional roasted section such as roast duck and roast pork, live stations for grill meat, fish & pasta and also we skipped the salad bar and cold cuts. The atmosphere here is elegant. There were ample space between tables and you can move around easily. The service staff are friendly and efficient. Our plates are clean regularly and the food on offer were topped up once it reach the halfway point. There a few supervisors on the floor to ensure the guests are well taken care off and the line up for the stations are smooth. 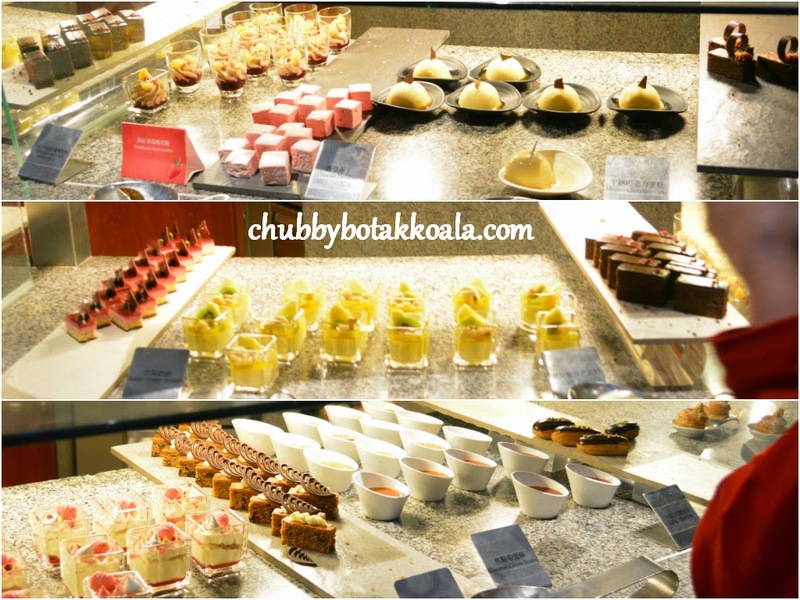 Overall, I have always been impressed with the buffet selection in Taipei and our experience in The Brasserie just reaffirmed this. For the price that we are paying NT$1,050 = S$46 is just value for money. If you are ever in Taiwan, this buffet is worth to try. Just remember to make the reservation well in advanced. Who knows, you might meet some celebrities or sport starts when dining here. Cheers!! !